Mary and Stephen Riggs left Hawley, Massachusetts on the first of March 1837, and arrived at Fort Snelling in Minnesota (then known as Wisconsin Territory) on June 1, 1837. They stopped to visit friends along the way, including the Burgess family in West Union, Ohio, and Stephen’s relatives in nearby Ripley, Ohio, where they eventually boarded a steamboat for the trip to Cincinnati. Mary wrote to her brother Alfred from there on April 26, 1837. She revealed that she had an artist paint a miniature portrait of her for $5.00 and that she was sending it to Alfred. She told him “ The only way I have to console myself for such an expenditure on my homely face is by hoping…that it will stimulate the possessor to more devotedness, more benevolence, more love to him and his cause in whose service we trust, we are engaged.” Unfortunately, the portrait of a young Mary apparently has been lost to time. 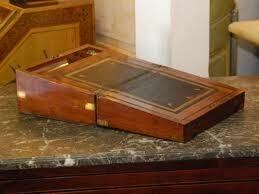 Mary’s escritoire may have looked something like this one. It is closed in the top photo and opened for use in the image above. however rather than have none and shall furnish it with inkstand sandbox paper, quills, etc., etc. 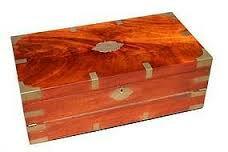 so that we have writing apparatus available.” That writing desk was to become one of Mary’s treasured possessions and she composed hundreds of letters on it for nearly three decades. 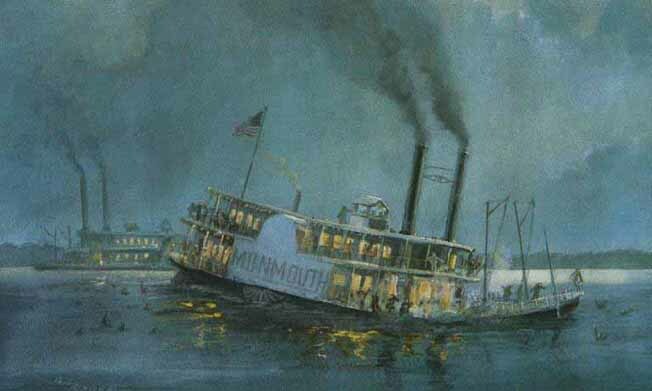 The steamships that brought Mary and Stephen to Minnesota were similar to the one pictured here. The Monmouth’s tragic journey from New Orleans to the Red River ended on October 31, 1837. She carried 700 Creek Indians, 300 of whom drowned in the Mississippi River. In the 1830s some 18,000 Creeks were moved from Georgia and Alabama to the west. The image is a watercolor painted by Paul Bender in 1998. Mary and Stephen had not intended to remain in St. Louis but they missed the Fur Company boat that they were to take north and had to hope for another one to arrive in a week or two. Then they apparently changed their plans and took a steamer to Galena, Illinois, on May 12, hoping to catch a boat there for Fort Snelling. Their stay in Galena, however, extended until May 25, during which time Mary and Stephen visited one of the city’s famous lead mines. By May 31, the travelers were 100 miles above Prairie du Chien, Wisconsin, and reached Fort Snelling the following day, three months after leaving Massachusetts. Followers of Dakota Soul Sisters may recall that the missionaries in the Fort Snelling area at the time included Julia and Jedediah Stevens; Jedediah’s niece, Cornelia Stevens (the future Mrs. Daniel Gavin); their foster daughter Jane DeBow; the still single Samuel Pond; and Persis and Samuel Denton. Mary mentioned in a letter to her brother Alfred on June 2, 1837, that Mr. Pond and Mr. Renville had arrived from Lac qui Parle. That would be Gideon Pond and Joseph Renville, Sr. On June 20, the Riggs gathered at Lake Harriet for worship with the Methodist missionary, Rev. David King, and the former black slave, James Thompson, who worked with King at the Mdewakanton Kaposia village in what is now South St. Paul, Minnesota. 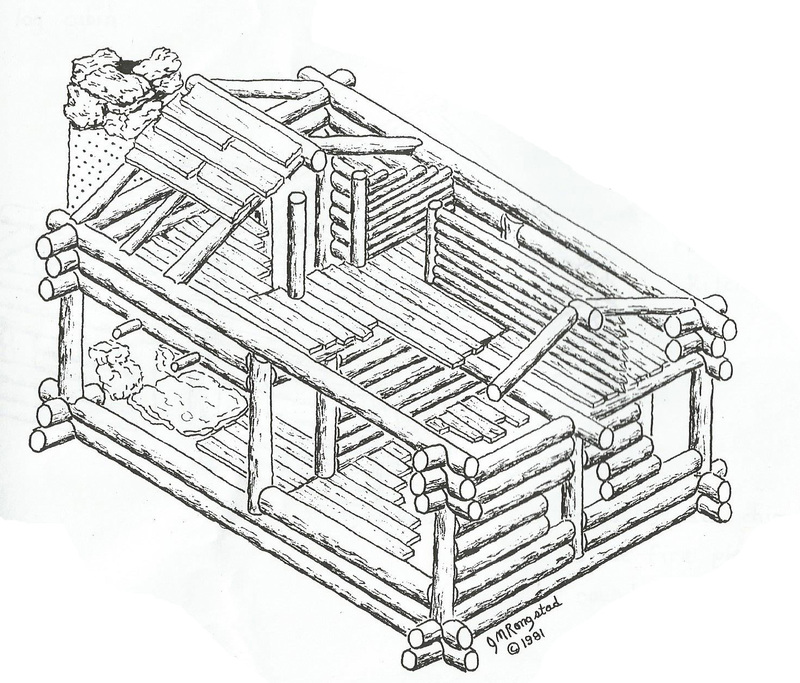 Artist J. M. Rongstad created a drawing of the Williamson mission house at Lac qui Parle in 1981. The house was a one and a half story structure, measuring 30 x 20 feet. The upper floor was 10 x 20 feet and contained a storage area and the bedroom where Mary and Stephen lived. Mary and Stephen’s first home at the mission was a single bedroom on the second floor of the Williamson mission house. Stephen made them a bedstead and they used a box they brought from Ohio as their table. Mary’s letters during these first few weeks reflect the fact that she had no way to send them. She wrote anyway, anticipating the day that someone would arrive who could take outgoing mail to Fort Snelling and bring them all long-awaited letters from home. 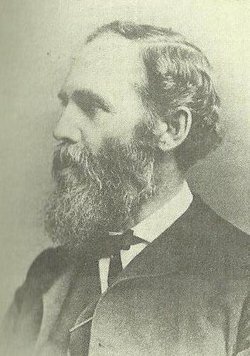 Alfred Riggs grew up in the Dakota mission and carried on his parents’ ministry as principal of the Santee Normal Training School founded in 1868 by his childhood friend John Williamson. That spring, Stephen left Mary at Lac qui Parle while he traveled to Fort Snelling on May 27, for supplies. He returned two months later with 30 letters and notes from friends and family and Mary was overjoyed to read them over and over again. The Williamsons, who had taken a trip home to Ohio in October 1838, returned to Lac qui Parle in June 1839. Alexander Huggins’ sister, Fanny Huggins, came out to join the mission with them. Earlier that year, Gideon and Sarah Pond and their little daughter Ruth, had returned to the Fort Snelling area to rejoin the mission work there. Mary and Stephen’s daughter Isabella also became a missionary. She married Rev. Mark D. Williams in 1866 and they were sent to China where Isabella died in 1897. 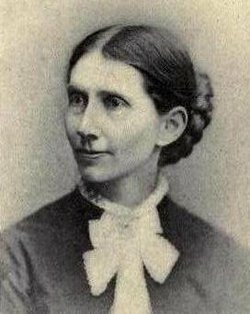 Martha Riggs married Wyllys K. Morris in 1866 and they were teachers at Good Will Mission at the Sisseton Agency, at the Omaha Agency in Nebraska and at Porcupine, South Dakota on the Pine Ridge Reservation. They had five children. Rev. John Eastman, one of Martha’s former pupils, said the final prayer at her funeral in 1910. 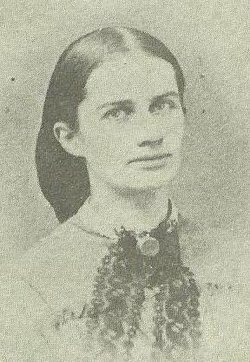 Another daughter, Martha Taylor Riggs, was born to Mary and Stephen on January 27, 1842. She was four months old when the family made their first trip home to visit Stephen’s family in Ohio and Mary’s in Massachusetts. It had been five years since they had been to the “States” as they called the country east of the Mississippi River. Mary wrote to her parents on February 26, 1842, that they had decided to leave two-year-old Bella with Fanny Huggins and that they would possibly have four-year-old Alfred remain with family in Ohio, rather than bring him along to Massachusetts. In the spring of 1843, Mary, Stephen, Alfred and Martha, now already over a year old, began their journey back to Lac qui Parle. They had three new recruits with them: Robert and Agnes Johnson Hopkins and Julia Kephart, all from Ripley, Ohio. Mary was also thrilled that her brother Thomas had agreed to come out and work with them for a time and she anticipated his arrival at Fort Snelling by the time they arrived there. For some time, Stephen Riggs had been looking for a new location for a mission station on the St. Peter’s River (now the Minnesota River) and during this journey back to Lac qui Parle he decided that a post at Traverse des Sioux would be an excellent spot. There was a bit of scrambling among the mission families at this point. Samuel and Cordelia Pond had gone to Lac qui Parle to help while the Riggs were out east. They now returned to the Fort Snelling area. The Williamsons had left Lac qui Parle in June of 1842 because a late frost had destroyed the crops and the doctor took a temporary post as surgeon for the garrison at the fort. He was committed to remain there until the fall of 1843. Stephen Riggs wrote: “In these circumstances, it was deemed advisable for Mr. and Mrs. Hopkins to go on to Lac qui Parle for a year. Mary took her baby, Martha Taylor, now fifteen months old, and went up with them to bring Isabella down. Thomas Longley, a young man of 22 years, and rejoicing in a young man’s strength, had joined us at Fort Snelling…..now he and I….remained [at Traverse des Sioux] to make a beginning…We expected to meet with opposition and so were not disappointed. Thomas and I pitched our tents under some scrub-oaks, on a little elevation, in the lower river bottom, a half mile away from the trader’s. “In the mean time the party going to Lac-qui-parle were nearing their destination. With them there were three young men who had accompanied us to Ohio, and spent the year. Their baptized names were Simon, Henok and Lorenzo. Each was about twenty years old. While on their way down, we had cut their hair and dressed them up as white men. They had all learned much in their absence; while two of them had added their names to the rolls of Christian churches in Ohio. Thus, they were returning. The party spent the Sabbath a day’s travel from Lac-qui-parle. On Monday, before noon, these young men had seen, on some far-off prairie elevation, what seemed to be Indians lying down. But their suspicions of a war party were not very pronounced. So it was that Mary, now 29 years old, began her new life at Traverse des Sioux on the Minnesota River. Ibid., A mosquito bar is another name for a mosquito net. Ibid., p. 92. Wamdiokiya or Eagle Help, was the first Dakota man who mastered the Dakota alphabet and was able to write letters in his own language. He reportedly took his daughter away from the Riggs when they criticized him for going to war against the Ojibwe after one of his wives, Mazaskawin/Silver Woman, was killed in an Ojibwe raid in the winter of 1839. He had a long and significant history with the missionaries and was hired by Stephen Riggs and Thomas Williamson to help other Dakota people learn to read and write for $5.00 per pupil in 1840. His son, Henok Appearing Cloud, was one of the three boys that Stephen Riggs took to Ohio in 1842. Ibid., p. 101. It isn’t clear who Anna is from Mary’s letters. There is an Anna Anpetu listed on Stephen Riggs list of boarding school students, 1835-1860 and an Anne without any last name is on Alexander Huggins’ 1845 list of church members at Lac qui Parle. Jane Smith Williamson, Thomas Williamson’s sister was also with this group. She was coming to Lac qui Parle to assist Margaret in caring for the children. She remained at Fort Snelling where the Williamsons were living until they all made the journey out to Lac qui Parle in September 1843. Ibid., pp. 78-79. Agnes Hopkins’ version of this incident will be included in her biography on Dakota Soul Sisters. This entry was posted in Dakota Mission, Lac Qui Parle Mission, Lorenzo Lawrence, Mary Ann Clark Longley Riggs, Traverse des Sioux, Women in Minnesota. Bookmark the permalink. Thank you Mark – I’m glad you found Dakota Soul Sisters and that learning about the Riggs family helped. I’ll check out noblesavageworld.